As a Busy Mom, I frequently am looking for mealtime and snack time solutions. Some nights, we need a quick and easy dinner because we have some sporting activity or school event to get to. Some nights, we need something that is not too heavy for dinner because we had a big or late lunch. Some nights, we are entertaining and are looking for a quick snack. What one product can help with all of these scenarios? 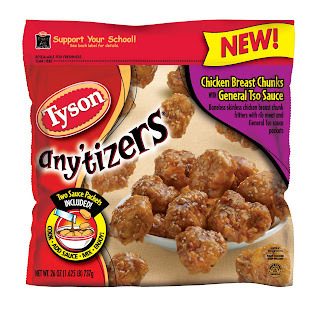 Tyson Any'tizers. With 26 varieties to choose from, there are many that my family would love (we haven't tried them all yet!). If I'm looking for a quick and easy dinner, there are many meal solutions. Like pairing Chicken Breast Chunks with Tso Sauce with some fried rice or getting the Pop Corn Chicken Bites and adding them to a tossed salad. For a snack while entertaining, we always enjoy things like the Buffalo Style Hot Wings or the Tequila Lime Flavored Wings. These eat up in a hurry - simply microwave for 3 - 5 minutes and you have a hot treat to share with company. It's great to have a hot appetizer and not have to hang out in the kitchen preparing it. Would you like to try some for yourself? I have the opportunity to allow two readers the chance to each try a bag for free. Head over and check out all of the varieties of Any'tizers here. Leave a comment answering the following question: Which variety are you most interested in trying and how would you use it? Giveaway will remain open until January 5th at 6 pm. Two winners will be selected using a random number generator. The winners will be contacted by e-mail (be sure to leave one!) and will have 48 hours to respond or a new winner will be selected. I received no compensation for this post. I received coupons to try the Any'tizers myself and to share with two readers through this giveaway. I'm a follower. (At least I was when I was 2 Toddlers and Me, I couldn't find the followers button on your site for some reason today). Nevermind about the followers button. I see your feed. Sorry about that - need some morning coffee I guess! I just saw that my previous comment posted twice -- sorry!! Definitely the buffalo chicken bites! I love HOT wings! I would save them for a late night snack to share with my husband. I'd serve the Honey BBQ Wyngs with a green salad and some fruit on a night we are pressed for time! Quick, delicious and easy it will be! I would love to try the Tequila Lime wings! Yummy! I could easily use some Homestyle Chicken Fries to make a quick lunch for my boys. I like the Honey Barbecue Boneless Wings, they make a great snack for my hubby and I (we can cook as little or as many as we want) for when we're watching TV or a movie after the kids are in bed. chicken cordon bleu minis - yuuumo! The Chicken Pepperoni Minis look good to me! I would love to try their Any'tizers® Stuffed Chicken Cordon Bleu Minis. I'd like to try the Chicken Breast Chunks with Spicy Sweet & Sour Sauce. I'd round out the meal with stir-fried veggies and sticky rice. Thanks for the helpful offer! Honey Barbecue Boneless Wings sounds great. the honey bbq wings sound yummy and would be a good side dish for my son's 2nd bday in feb. They all sound yummy, but my whole family would love the Any'tizers® Stuffed Chicken Cordon Bleu Minis (Bagged)!!! I'd try either the Chicken Breast Chunks with the General Tsao sauce or the Chicken Cordon Bleu - they both sound good. I'd like to try Chicken Breast Chunks with Tso Sauce. We love Chinese dishes, would like to tr this with steamed rice and saute veggie! The popcorn chicken bites sound great. I would love to try to Popcorn Chicken bites. I would use them as a quick lunch for my kids, ages 2 and 4, who are obsessed with any type of breaded chicken products :) Thanks for the giveaway (my email can be found in my profile). Chicken breast chunks with sweet and spicy sauce! Yum! I love the Jalapeno Chicken bites. I would use them for the Super Bowl party I am planning. Popcorn Chicken Bites look great. Thanks for the chance to try these. The Cordon Bleu Minis sound great! i would love to try the Chicken Breast Chunks with Tso Sauce and serve it over homemade fried rice. i so want chinese food right now! I'd pick the honey bbq boneless wings, and just serve with celery sticks, for a sunday watching football! I would love to try the popcorn chicken for dinner!